Stack sampling is used to determine the rate and amount of pollutants leaving an industrial source. 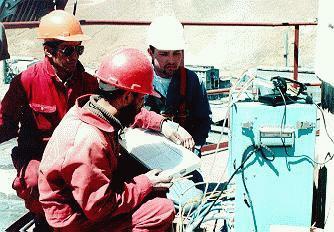 The picture shows technicians performing a test at a primary metals smelter in South America. U.S. EPA methods 1-6 and 29 were used to quantify particulates and multi-metal emissions from several 330 foot stacks.